On October 13, Health Communication (COM 4022) students had a chance to see how FIU College of Medicine teaches medical students health communication through experiential education. Elena Nuciforo, Communication Arts Assistant Professor, involved her students in a discussion of the NeighborhoodHELP™ project to showcase a community-based health communication between caregivers and patients. The course touches upon a wide range of topics including communication within healthcare settings, health communication interventions, behavior change campaigns, communication within health organizations, health communication online, social support, health promotion materials, and sociocultural issues in health communication. Using their own internet-based research and the knowledge they learned in class, students were asked to come up a list of questions, concerns, and ideas on how they believed the project could be improved. Guest speaker, David Brown M.D., Chief of Family and Community Medicine and FIU Associate Professor, provided first-hand knowledge of the advantages and challenges of involving medical students in working with underserved communities. He explained how the program uses communication principles in working with the patients to create more effective conversations with community members of different age groups and economic backgrounds. He also discussed how the program helps to tackle the deeper issues and social determinants of health. The program has proven to be beneficial both for the low-income communities that it involves and the medical students who work with households for up to three years. Students in the health communication class were excited to learn about this innovative project and many expressed interest in volunteering for future opportunities. 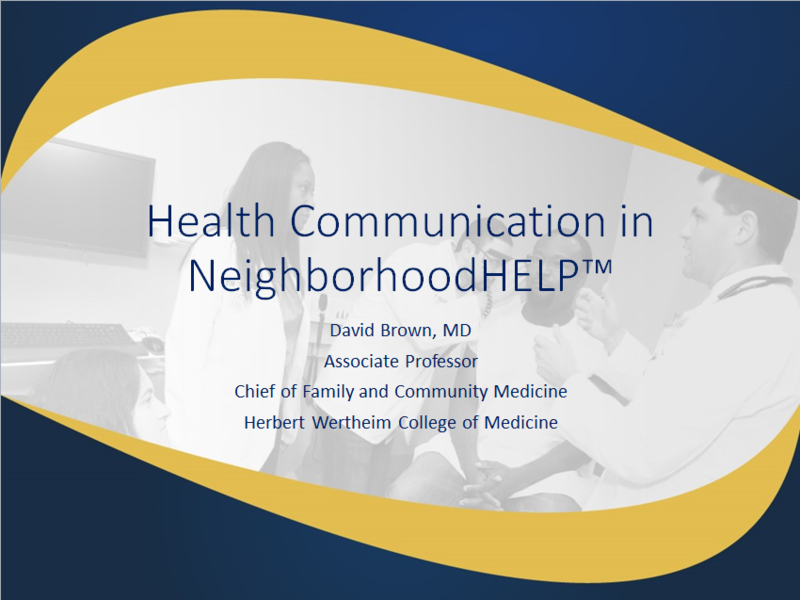 The NeighborhoodHELP™ program presents a unique opportunity for possible collaboration between Herbert Wertheim College of Medicine and the Communication Arts department. Elena Nuciforo’s expertise in the field of health communication and community-based programs, specifically in the public health sector facilitated the collaboration. Nuciforo will use this on-going collaboration as a tool to explore experiential education through service learning. She will present on her experience of teaching service learning as a core part of a communication course at the National Communication Association’s annual convention this November. Nuciforo earned her PhD in communication from the University of Massachusetts. She also holds a Master of Education degree from the Center for International Education at UMass Amherst and a higher education diploma in teaching English as a foreign language from Buryat State University in Ulan-Ude, Russia. Dr. Nuciforo’s research focuses on social interaction, Russian culture and communication, and health communication. She is a native of Russia and has extensive experience working in international and intercultural environments, both in Russia and the USA.